The Chinese have launched the ChinaSat-12 (Zhongxing-12) communications satellite into orbit via a Long March 3B/E (Chang Zheng-3B/E) on Tuesday – their 18th orbital launch of the year. 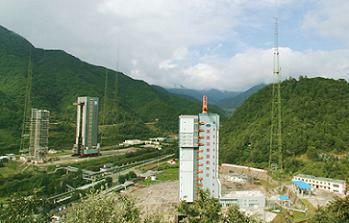 The launch took place at 10:13 UTC from the LC2 launch pad at the Xichang Satellite Launch Center. This bird was originally called Apstar-7B, a Spacebus-4000C2 platform geostationary communications satellite, with 24 C-band and 23 Ku-band high power beams. 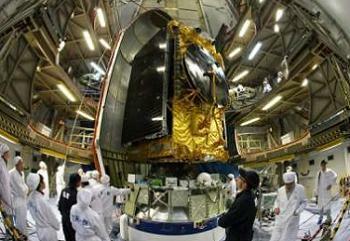 It was contracted to Thales Alenia Space of France for construction, on behalf of APT Satellites, in April of 2010. Apstar-7B was a back up satellite, in event Apstar-7 failed to make it to orbit. However, the launch – carried out on March 31, 2012 – was a success, allowing Apstar 7B to be transferred to a secondary agreement between APT Satellites and the China Great Wall Industry Corporation (CGWIC). With the secondary agreement in place, the satellite was taken by China Satcom – a state-owned satellite operator in Beijing – and renamed Zhongxing-12 (or ChinaSat-12). Zhongxing-12’s role is to replace Zhongxing-5A (ChinaSat-5A) at 87.5 degrees East. 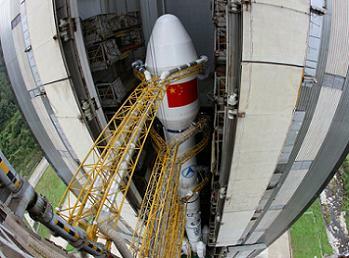 Zhongxing-12 had a lift-off mass of 5,054 kg and a design lifetime over 15 years. It uses a S400 propulsion system and is equipped with two deployable solar arrays. Part of the satellite’s communications payload has been leased to Sri Lanka and is co-branded as SupremeSat-I. Recently, SupremeSat entered into a partnership agreement with CGWIC for the design, manufacturing and launching of the SupremeSat-III satellite and also to secure the marketing facilities of many other satellites owned and operated by CGWIC and the China Satellites Communications Corporation. This satellite will be based on the DFH-4 platform and will be positioned at 50 degrees East Longitude after being launched by a CZ-3B/E launch vehicle. Supremesat-II will be launched in mid 2013 and will also lease capacity on the Zhongxing-11 (Chinasat-11) Chinese made communications satellite. Zhongxing-12 will serve the demands of communication, satellite broadcasting, data transmission, digital broadband multimedia system and media streaming services in China, East Asia, South Asia, Middle East, Africa, Australia and China Sea area, and the Indian Ocean region. The Spacebus 4000-based medium-class telecommunication satellite has a successful flight heritage, and can easily accommodate a large range of payloads in every band (Ku, C, Ka, X, S, L) to satisfy customer needs. The solar array power offered by the Spacebus 4000 is up to 15.8 kW with a payload power up to 11.6 kW, typically 80 to 100 active channels with medium RF power (105/110W in Ku band), standard equipment and system designs available in Ku/C and Ka frequency bands, while other frequency bands (X, S, L) can be proposed. China’s 18th launch in 2012 was also the 173rd successful Chinese orbital launch, the 173rd launch of a Chang Zheng launch vehicle, the 9th launch from Xichang in 2012 and the 77th orbital launch from Xichang. (Images via ChinaDaily.cn, Xinhua and weibo.com members at the location).